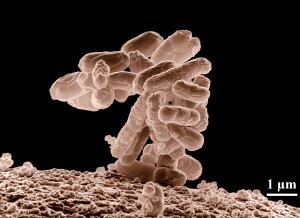 Electron microscopic image of E. coli bacteria (10000x). Image credit: Eric Erbe, digital colorization by Christopher Pooley, both of USDA, ARS, EMU. I do not know to what extent the news is also dominating in other parts of the world, but here in Europe the last few weeks saw one of the worst bacterial outbreaks since decades. The media, naturally, was (and still is) full with reports on this epidemic. The EHEC (enterohemorrhagic Escherichia coli) bacterium is a new E. coli strain which is not only highly infective, but can also cause a range of serious, life threatening conditions, including bloody diarrhea, kidney failure and neurological disorders. The bacterium is contracted over food, at least this is the suspected mode of transmission. Most infections occurred in Germany. The general public scare resulted in a dramatic decrease in the purchase and consumption of fresh vegetables, even in those parts of Europe that were not affected by the outbreak. Consumers were (and are) simply afraid and this had a dramatic impact on the sales statistics of vegetables. The public scare, emerging conspiracy theories (is the epidemic a biological warfare experiment? ), as well as sometimes contradictory information (first Spanish cucumbers were the source of infection, later this was taken back), may motivate some people to take things into their own hands. Is it possible to test vegetables and other food, as well as one owns stool for the presence of EHEC, using microscopic observations? I have already read such questions in microscopy related forums and I think that this issue needs some clarification. After all, this question of microscopically testing food and body fluids for the presence of pathogenic (ie. disease causing) bacteria is not only limited to EHEC but was also asked in connection to Clostridium difficile and other bacteria. It is a question that reappears periodically and there seems to be a need for an explanation. Here, for once, the answer is quite easy: It is not possible to use microscopic observations for identifying bacteria. I know that this may sound ironic, because, historically, microscopes were those devices that gave the field of microbiology and bacteriology a great push forward. In the following, I would like to outline a few points why it is not possible to use microscopes for testing for the presence of pathogenic bacteria. The shape of bacteria, their morphology, does not provide information on the danger of the organism. Bacteria are disease causing, if they possess so called “virulence factors” (this term has nothing to do with viruses). The virulence factors can either be toxins that are released, or structures on the surface of the cells that allow the bacteria to adhere to surfaces, such as the wall of the human intestine. These virulence factors can not be observed microscopically. Two bacteria that have exactly the same morphology, one can be pathogenic, the other one not, depending on whether they possess these factors or not. For diagnostic purposes morphology is pretty much irrelevant. To use an analogy: Just because two cars have the same shape does not mean that both of them are safe to drive, one of them could have a safety problem, which can not be seen from the outside. And just because your own car is a blue Ford does not mean that all blue cars are Fords. Just like morphology, the color of a car says nothing about its internal characteristics and model. The bacterial density on food is too low for microscopic observation. In the case of EHEC, eating about only one hundred bacterial cells are enough to cause an infection. If these bacteria are distributed over the whole food, then which part of the food should be microscoped? The chances are pretty good that there are thousands of other, non pathogenic, bacteria present as well, so how do you want to distinguish them? Generally, the bacteria have to be enriched by placing the suspected food sample into a growth medium, where they reproduce. The bacteria have to be cultured first, before they can be analyzed. Now this is something that I would definitely not recommend to do for safety reasons. It is even illegal for non authorized people to do this, after all, one does enrich potentially pathogenic organisms. Even if an enriched culture of bacteria is available, the problem would be the same as the problem mentioned above. The shape of a bacterium says nothing about its danger and its kind. Some people may simply be interested to test for the presence of bacteria on their food, to assess whether it is safe for consumption or not. They simply want to check if “something is there”, disregarding if it is EHEC or not. If bacteria are present (regardless of the kind), then they would play it safe and not consume the food at all. No fancy tests would be needed in this case, and enrichment is also not necessary. Take a cotton swab, collect some bacteria from the surface of the vegetable, transfer them to a slide and observe them under the microscope. This should work? Or not? There several false assumptions made. First, they assume that food is generally free of bacteria, which is not the case. The vast majority of them are not pathogenic, however. Bacteria are omnipresent and there are even more bacterial cells growing on and in our human body than we have body cells. They simply can not be avoided and are part of out natural environment. Unless one sterilizes the food, bacteria are certainly to be found. The second false assumption is that often people think that most bacteria are pathogenic. Bacteria have a negative connotation, and are linked, in public perception, to the “three Ds”: dirt, disease and dismay. Bacteria truly need a lobby, and more positive PR, I may remark. Generally finding bacteria on food says nothing about the quality of the food product. It’s the type of bacteria that matter, and this, we know, can not be determined microscopically. There is also a third false assumption. If one is not able to see bacteria under the microscope, it does not mean that none are present. Bacteria require more advanced optics (phase contrast) and a certain amount of skill to distinguish them from non-bacterial objects. They can be quite small as well. And the density of the bacteria can be quite low. What do the labs then do? They selectively enrich the bacteria and analyze a range of biochemical, immunological and genetic parameters. At the end they make a nice false color a 3d image of EHEC using a scanning electron microscope so that they have something nice to show to the media. Pictures from a light microscope often do not look spectacular enough. Still, these pictures are not used for diagnosis or identification purposes. Now, it is possible to use labeled antibodies and mark the bacterial antigens to test for EHEC and other pathogens. This is a more advanced procedure and in this case it is not the bacterial morphology that is used for identification, but rather the ability of the antibody to interact with structures on the bacterial surface. I just wanted to briefly include this point for the sake of completion. Many words, but simple message. One can observe bacteria microscopically as much as one wants, but one will not be able to assess their danger this way. Microscopic observation has no diagnostic relevance. One will not even be able to say if two bacteria of the same shape are genetically related or not. Without culturing the bacteria (don’t do this), chances are pretty good that the bacterial density is not even high enough for you to see anything under the microscope, unless your food sample was spoiled. But in this case you don’t even need a microscope to know that. There is a comment form below! Very informative but I think many microscopists have enough science to appreciate the danger. Thank you for the article. I remember your reply, along these lines, regarding someone’s question on finding his own c. difficile.